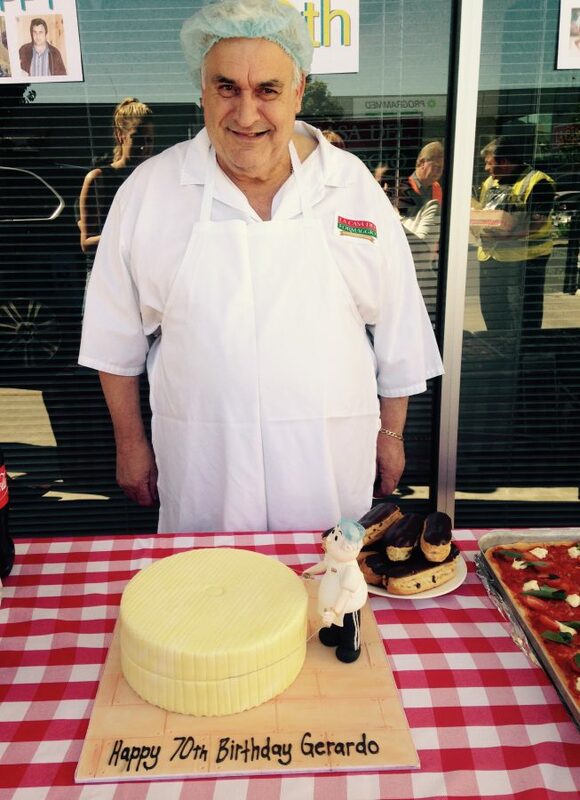 On February 10th, 2015 we celebrated the 70th birthday of our founder Gerardo Cicchiello! 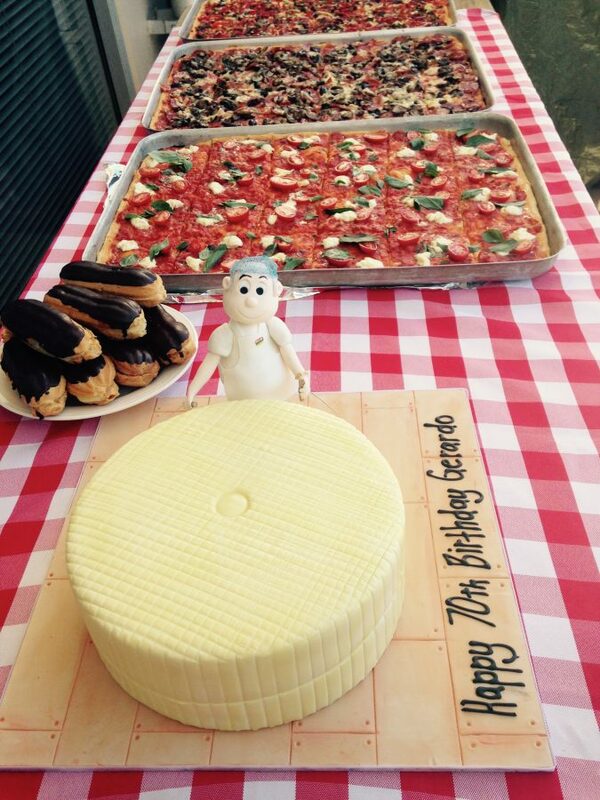 A fine Italian celebration was held in his honour, with all of his Italian favourites – pizza, eclairs and chinotto! We also commissioned a special birthday cake made by How Sweet It Is, a cake maker on Pulteney St in Adelaide. The chocolate 4 layer cake features a miniature icing figurine of Gerry, cutting a large wheel of cheese. This is a tribute to Gerry’s tireless commitment to cutting and grating cheese for our Factory Outlet Shop 6 days a week, without a day off. The figurine was modeled after this picture of Gerry – pretty good attention to detail, huh? Gerry commented that this was a grand celebration for him. Growing up on a dairy farm in Provincia di Benevento with 9 brothers and sisters, they never celebrated birthdays – they would be celebrating all the time, he said! 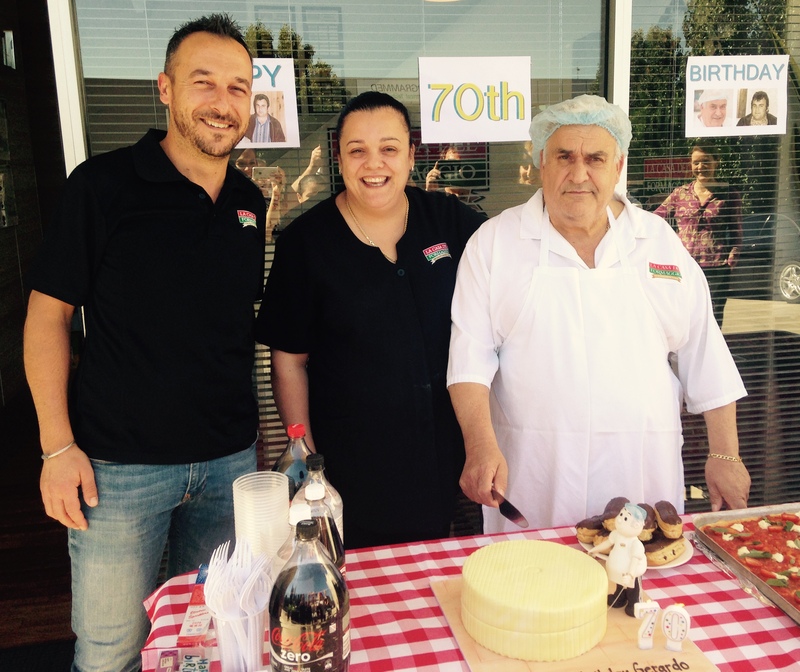 His children, our Managing Director Claude and Shop Manager Marisa, were there to help Gerry celebrate, along with a big group of La Casa Del Formaggio staff including factory workers of 10+ years!